It’s a worrying precedent. In Australia, where many fine science correspondents have lost their jobs, PhD students are being asked to write science stories from published research papers – for publication in the mainstream media without any payment! And all this while jobs in the industry, particularly across Europe, are falling. 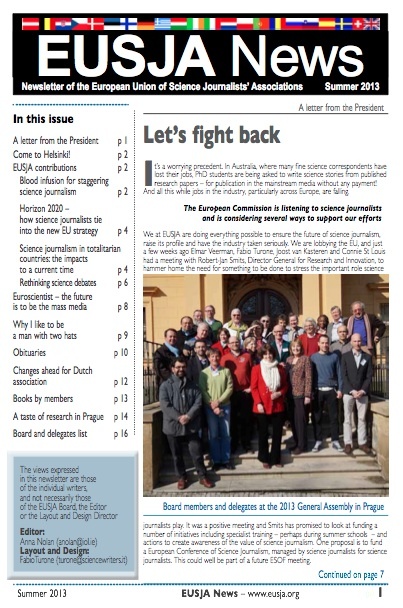 We at EUSJA are doing everything possible to ensure the future of science journalism, raise its profile and have the industry taken seriously. We are lobbying the EU, and just a few weeks ago Elmar Veerman, Fabio Turone, Joost van Kasteren and Connie St Louis had a meeting with Robert-Jan Smits, Director General for Research and Innovation, to hammer home the need for something to be done to stress the important role science journalists play. It was a positive meeting and Smits has promised to look at funding a number of initiatives including specialist training – perhaps during summer schools – and actions to create awareness of the value of science journalism. 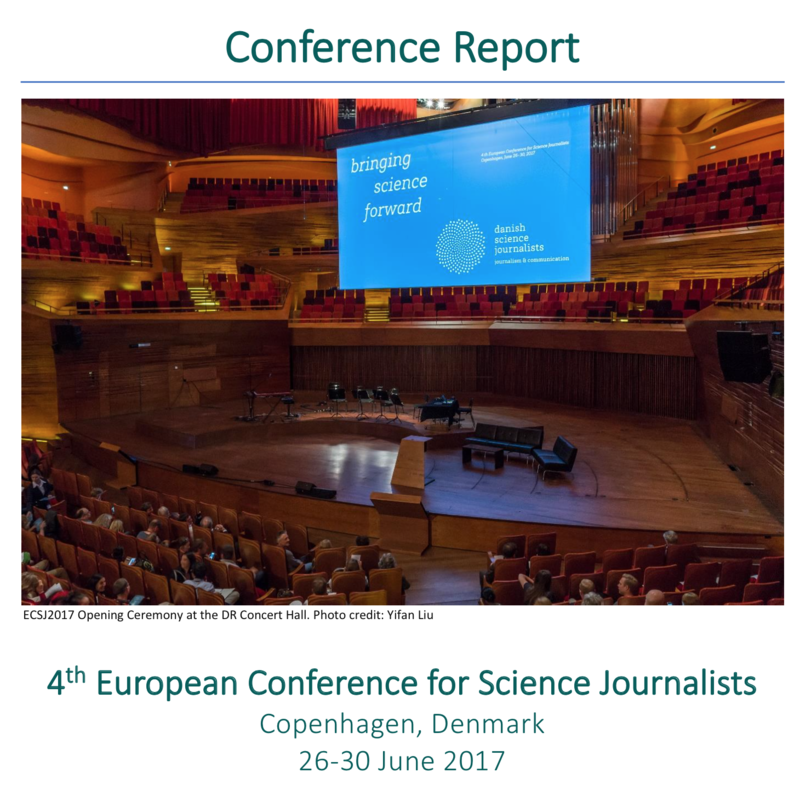 One proposal is to fund a European Conference of Science Journalism, managed by science journalists for science journalists. 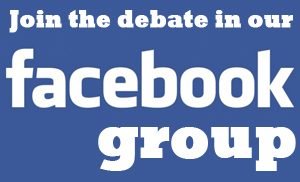 This could well be part of a future ESOF meeting. At the moment these are merely items for discussion and there is nothing concrete and fully funded on the table. But they are positive steps, and if the sector can raise its standing. and demonstrate that science journalists are professional beings with a solid body of training behind them, things can only improve. 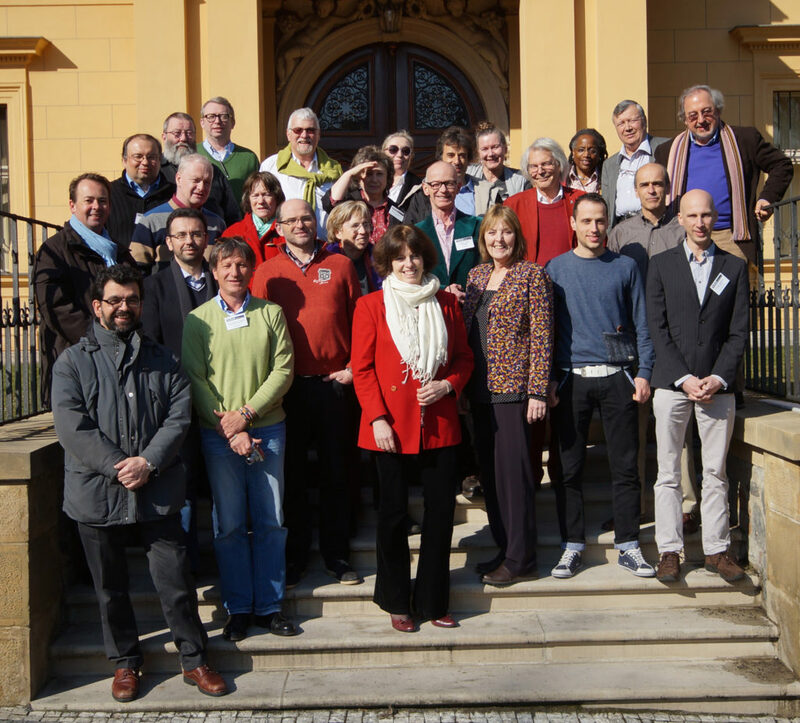 Board members and national delegates at the General Assembly 2013 in Prague. When I entered the journalism profession it was necessary to enrol on the NCTJ course – National Council for the Training of Journalists. This training was undertaken, after a six month probationary period, over three years on day release courses, or two months a year block training and, of course, on the job training. Once one had the coveted diploma – and all future employers then asked for it – it was easier to move onwards and upwards. Maybe this is what science journalism needs, proper, structured training for all who would enter into the profession of journalism. One controversial point raised recently is that perhaps there is a need for members to begin considering they are, first and foremost, journalists. Properly trained journalists should, using the basic tools of the trade, be able to turn their hand to writing anything. If those with staff jobs can demonstrate they can cover other areas, their positions may be more secure. I know this to many might seem a backward step but sometimes, especially in today’s financially austere climate, one has to take two steps back to move forward. A recent show of hands at our General Assembly in Prague showed that a number of members have indeed taken a sideways step into areas such as science communication, training and public relations. Many are older members with a solid career in science writing and broadcasting behind them. Could they be the tutors of the future? Would they need to qualify as teachers before training others? Do we want and need proper structured training in the profession of journalism, and if we accept EU money for training are we in danger of becoming EU loudspeakers? As I said earlier, these are some controversial points for discussion. 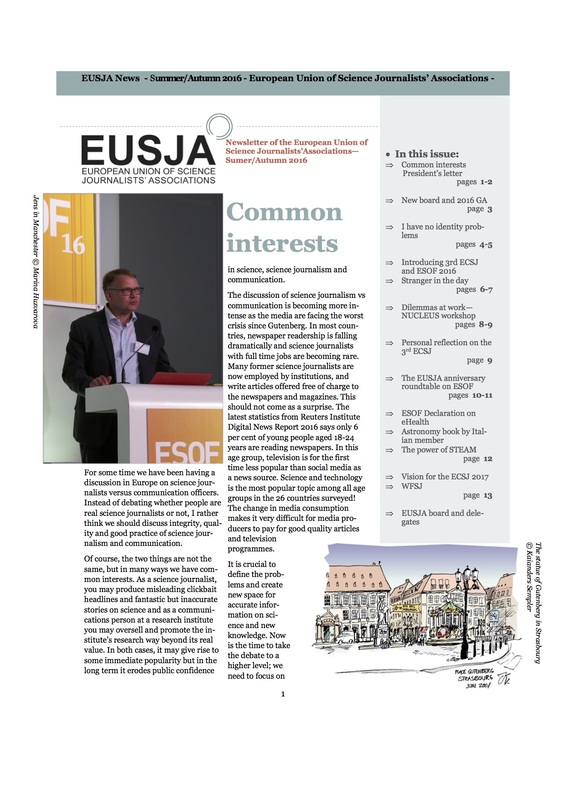 Please do respond – on our web page or in a reader’s letter to the next issue of EUSJA News. The EUSJA Board and EUSJA News would love to and need to, hear your views. In the meantime please continue to raise EUSJA’s profile. If you haven’t already done so, add EUSJA to your business card, buy adding “(affiliated to EUSJA)” after the name of your association. Take EUSJA leaflets to any conferences or international meetings you attend and encourage your colleagues to join your national associations. There is strength in numbers.